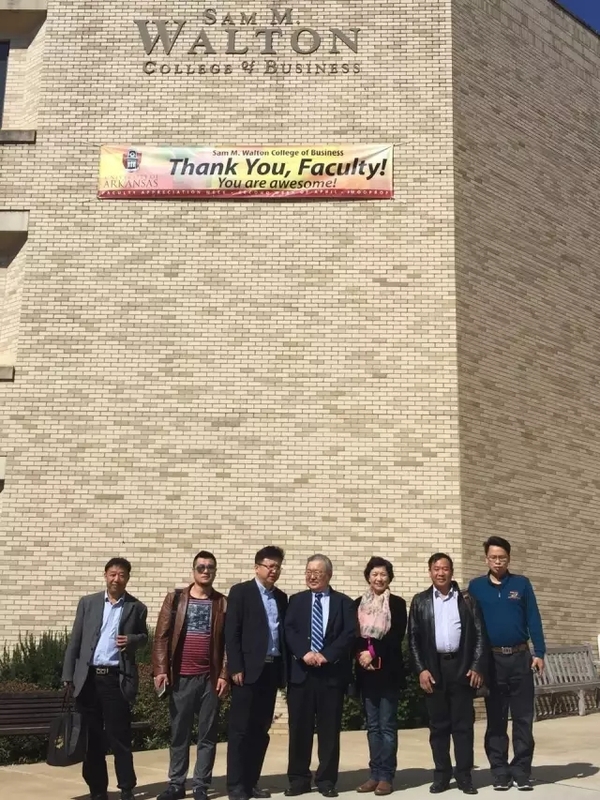 In the morning of April 4, 2016, delegation of Shenzhen logistics enterprise visited the Walton College of Business, University of Arkansas in Fayetteville, Arkansas, which is funded by Sam Walton, the founder of Wal-Mart. It is a top 50 ranked business college that enjoys high popularity in the supply chain major due to its intimate relationship with Wal-Mart. As the cooperation negotiation between Shenzhen Logistics and Supply Chain and Walton business college has been launched in 2005, the visit of the delegation was warmly received by Professor Williams, the Department Chairman of the college, and the two sides had a deeper and further discussion about the cooperation. To make the communication more effective and professional, professor Williams also invited Professor Liu, director of the financial department of Walton College of Business to assist with interpretation, which allowed the delegation have a further discussion in the financial aspect of supply chain. The Wal-Mart NO. 64 DC is a highly automatic distribution center with large floor area and numerous stores. The delegation visited and learned the operating process and process nodes of the distribution center. In the afternoon of April 4, 2016, the delegation came to the Wal-Mart NO. 64 DC in Bentonville, Arkansas. The distribution center occupies an area of more than 130,000 square meters and is in charge with distribution business of more than 160 Wal-Mart stores, covering 300 square miles of Wal-Mart stores around Bentonville. The manager of the DC made a detailed introduction of the operating process to the delegation and showed the delegation every process node. The distribution center built in 1980s impressed the delegation deeply with its high degree of automation. Discuss the construction issue about the overseas warehouses with the mayor in West Memphis. The freight transport of West Memphis can cross 75% area of the whole United States with 2 days ride. The railway shoots through Long Beach Port and the waterway connects New Orleans. Located in Memphis，Tennessee, Fedex freight transport center is the second largest freight transport center which is only next to Hong Kong. It mainly exports agricultural products such as rice. Plenty of floor operation business of Fedex is carried out in West Memphis. Its warehouses throughout the united states enjoys 90% utilization rate and 2 of the warehouses is fully used. The America handling and supply chain exhibition is the largest scale exhibition of the same kind in the United States. The president of the United States attaches great importance to the exhibition and writes address oration for each session of the exhibition journal.